The flexible and sweat proof Plantronics BackBeat FIT wireless headphones are great for runners and cyclists as they keep pace with you while you clearly hear your music, while at the same time they let you hear your surroundings and be seen at night for safety. The neat reversible neoprene armband is handy for storing your smartphone while you’re moving, then can be used to store your headphones when finished. 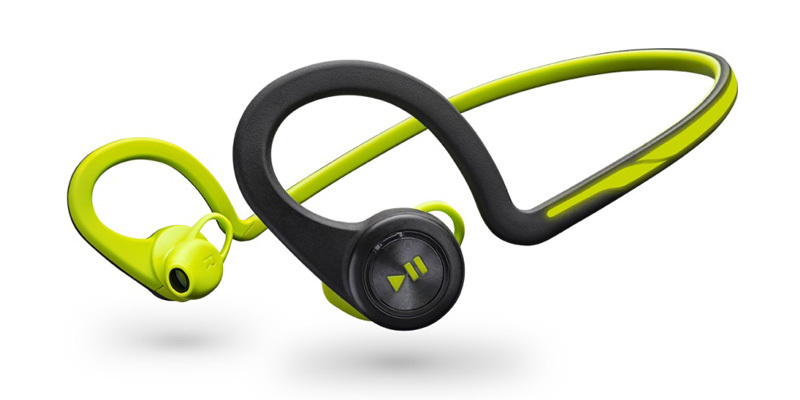 The Plantronics BackBeat FIT Headphones are comfortable with a flexible design that fits comfortably during exercise, plus the on-ear controls are easily accessible so you can keep moving while controlling music or calls. The BackBeat FIT is an excellent choice for those that love outdoor training, but also works well in gym environments too. The Plantronics BackBeat FIT headphones are protected against through rain and sweat by using P2i nano-coating technology which is applied during manufacturing to give the headphones an invisible liquid repellent. The battery technology provides up to 8 hours of listening time, 6 hours of talk time and 14 days of standby time, plus there is a “DeepSleep” hibernation mode which can keep the headphones charged for up to six months if not in use when out of range from your phone or tablet. The rugged waterproof design and bright colours keep you safe at night and the reversible neoprene armband which secures your smartphone when running and reverses to store headphones when not in use is a really useful feature that other manufacturers should take note of. The speakers themselves are powerful and deliver heart-pumping bass and good crisp sounds, these are not just good waterproof headphones, they are good headphones full stop! Highly recommended for those who love to experience the outdoors in all weathers.